Many people think it is impossible to train a cat to perform tricks, but when you think about it, large cats have been trained to perform tricks in circuses for hundreds of years. You know your cat has intelligence and some degree of learning capability. While this may not enable your cat to graduate with a degree in Feline Studies, you can harness a little of the cat’s independent streak and train him to perform tricks, such as sitting, sitting-up, shaking hands, rolling over and jumping through a hoop on command. Who knows, next stop Hollywood! Success will need to be reinforced with very tasty food treats – after all, training your cat to perform tricks is not a function of a cat’s natural behaviour. He will want to perform these tricks because it is fun for him and a very creative form of communication between cat and owner. All training should be carried out in a quiet location, without any form of interruption. Trials have shown that a cat of average ability can learn these tricks in approximately ten lessons. Some cats will learn faster, others will take longer. Success is also down to your skill as the trainer, your perception of your cat’s abilities, your success in communicating your commands, and the degree of physical prompting you may have to use initially. While training, you will need to sit in front of your cat to speak to him. and show him certain actions. Responding to the command “Sit” forms the basis for the additional tricks of shaking hands, sitting-up and begging. 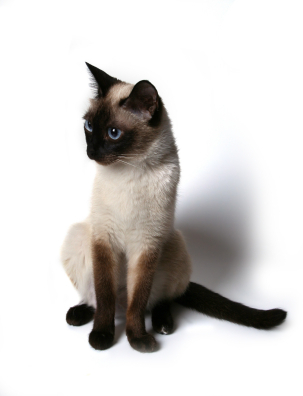 Take your cat to the required location, such as a stool, a chair or a table. Make sure the chosen item has easy access for the cat. Show your cat the item you would like him to sit on. With a food treat in your hand, place your cat on the stool. Show him the treat as you say “Sit”. Your cat’s response will probably be to either jump up to your hand or stand up on his hind legs to reach the food treat. Place your hand on his rump and push him down. Say the word, “Sit”. Your cat may react with a miaow or jump off the stool. He will certainly be puzzled in the early stages of training. Repeat steps 2 – 4 a few times. If you have succeeded in getting your cat to sit at the end of the lesson, say the word “Good”, give him his treat and lots of praise. You may have to repeat this training session over a few days. Some cats will catch on at the end of one day’s training, other cats will need their training to be reinforced over a few days.